The adorable buttons were a gift from Ariadne, I just laid them on the fabric for the photo but will sew them on when I fully finish the piece. When that one was finished I had four days free to stitch anything I wanted, unfortunately the frog came to visit! Then it was 12 Days of Stitchmas again! This year I decided to make a start on the 12 Ornaments I will be stitching for the Christmas Ornament Blog run by Kaye. There are three themes in 2019 and I have decided to go for the Just Cross Stitch Ornament Special 2001 - 2010. I have chosen my 12 designs from the magazines and started four so far. Today is the Fourth Day of Christmas. 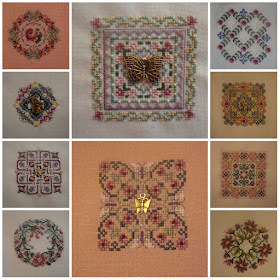 I debated whether to stitch design 2 as well but thought that as the Quaker Tree is quite large, I'd rather focus on that each day. I will thank myself once we get further on and I'm not trying to fit 10 designs into one day! I am choosing my own colours on the Festive Quaker Tree and didn't get much done today as the paler colours blend into the fabric too much. I frogged and will restitch with a medium blue and B5200. 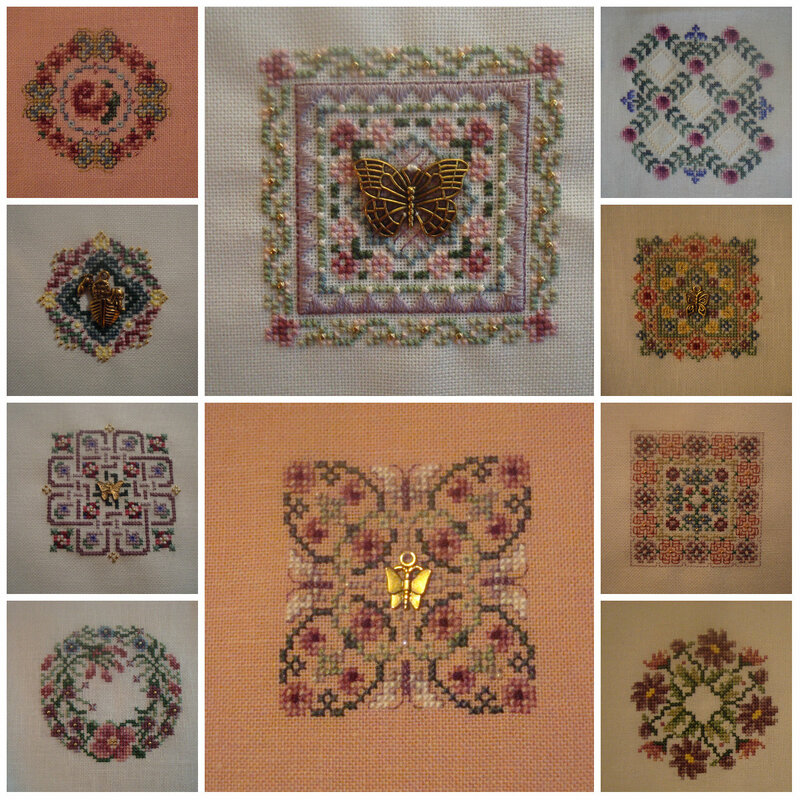 Throughout the year I was stitching 30-a-Day on my Just Nan Smalls. That ground to a halt in September when I switched to Leonore's Wedding present. Finally, there is housekeeping to be done on the blog, the "19 in '19" list to be finalised, the Gifted Gorgeousness SAL to set up for next year and the Happy Dance list and blog to be updated. Plus rather a lot of emails to answer. Good thing I have some time off work! Congrats on all of the great finishes this year Jo. Love all of your new starts. Nice finishes! Very well done. Great stitching!! I really hope we hear from Heather soon. 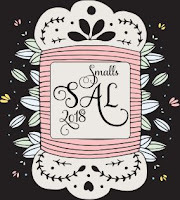 I love the Smalls SAL. Your finishes are all so beautiful. I haven't even had a chance to look through my magazine, so that is wonderful you have a head start for next month. Have a great New Years. Jo Congratulations on your finish's, you are one amazingly hard working Lady. I love the Just Nan ones--it looks like your 30 a day really led to some nice progress. I'm planning to take part in the Christmas Ornie SAL again next year, but haven't decided which theme yet. Love your 12 days of Christmas ,and the Just Nan designs all look wonderful . Happy New year Jo to you and your family . Lovely finishes - you had a great year! The JN's looks fabulous in the collage. It will be fun watching all the designs grow! Wonderful stitching Jo! The Just Nan pieces are beautiful and I really love the buttons on your Stitching Friends piece :) Your stitching is always gorgeous. Hope you have a Very Happy (and Stitchy) New Year! Lovely stitching as always and I'm sure you're ready to start 2019... but without that darn frog! Ooo I spy some very beautiful blue sparkly fabric! You had a successful Smalls year for sure. All those Just Nans! And all the little Bride Tree ornaments too. Love your finishes. Great job as always. Love your new starts as well. So, does that mean there won't be a 'real' 12 Days design on the go this year?